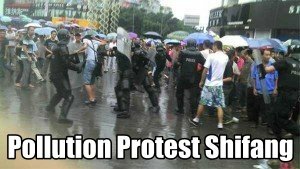 In this post global information tracking protests around the world picks up in China. The smog in Shifang has created an uprising reportedly from Beijing. Read all about it over on Stirring Trouble Internationally. Pollution is seen by Chinese leaders as the price of economic growth. But the Chinese people no longer see it that way. Expect trouble to flare.